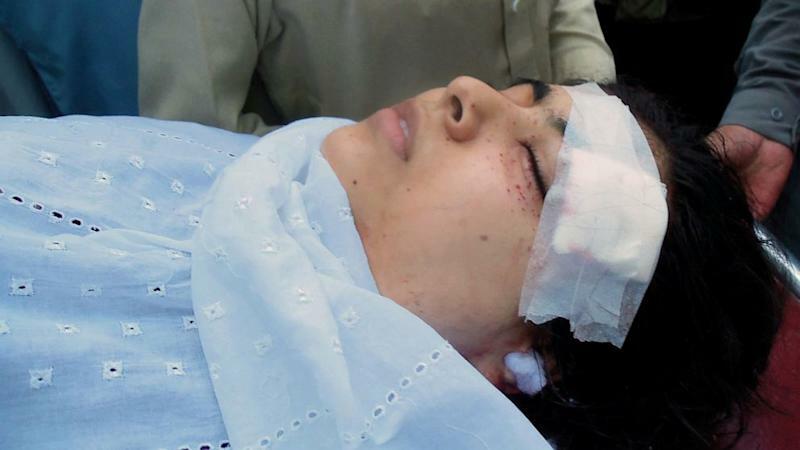 Malala Yousafzai survived a Taliban bullet that shattered her skull's thinnest bone, driving fragments into her brain. But one day later, as she lay in a medically induced coma in a Peshawar, Pakistan, hospital, her condition suddenly deteriorated, and her doctors did not know whether she would live or die. The 15-year-old would survive to become a global icon of courage and an international ambassador for girls' education. That part of her remarkable story is widely known, but what hasn't been told before is how close she came to dying in the hospital and how a team of doctors and the most powerful man in Pakistan made sure that did not happen. In exclusive interviews for ABC News and the BBC News on the one-year anniversary of her shooting, Malala's doctors reveal for the first time how she developed a serious infection and suffered from organ failure in the hospital, in part because of inadequate care. They also reveal tense moments leading up to her first, crucial surgery, and how Gen. Ashfaq Parvez Kayani, the chief of army staff, was personally involved in overseeing the Pakistani army's essential role in saving her life. And they reveal that at the center of this life-and-death drama were two previously unknown doctors from Birmingham, England, without whose intervention Malala might have died on a hospital bed in Peshawar. On the morning of Tuesday, Oct. 9, 2012, Malala boarded her schoolbus in the northwest Pakistani district of Swat. The gunman had no doubt whom he was looking for. He asked for Malala by name, then pointed a Colt 45 and fired three shots. One bullet hit the left side of Malala's forehead, traveled under her skin the length of her face and then into her shoulder. The news quickly filtered south 200 miles to General Headquarters, Pakistan's equivalent of the Pentagon. Gen. Ashfaq Parvez Kayani, who had met Malala during previous visits to Swat, immediately realized this was not just another attack in a district where the Taliban still held considerable power. "He recognized that she was a symbol," says Dr. Javid Kayani, an intensive care surgeon and deputy medical director of University Hospitals Birmingham, who happened to be in Islamabad for a meeting with the army chief that day. "He knew that if her life had been extinguished, then that would be a victory to the forces of darkness." The army chief ordered a military helicopter to evacuate Malala to a military hospital in Peshawar, the regional capital. That order alone was unusual: Hundreds of civilians had been targeted for assassination by the Taliban, and few if any had been transported via military helicopter. In the hospital, army neurosurgeon Col. Junaid Khan told ABC/BBC News that Malala was conscious but "restless and agitated." She seemed stable, and Khan kept a close eye on her. Four hours later, though, her condition deteriorated. Khan realized the bullet had caused Yousafzai's brain to swell and that she needed emergency surgery to remove a portion of her skull to relieve the pressure. But Khan had to fight for permission. According to Drs. Javid Kayani and Fiona Reynolds, a pediatric intensive care consultant from Birmingham, who was also in Islamabad that day, Yousafzai's family did not trust Khan because he looked so young. Malala's father, Ziauddin Yousafzai, wanted a civilian doctor to see her. There was also a push to evacuate her immediately to Dubai. But by late evening, Khan told Malala's father there was no choice: Khan had to perform the surgery to relieve the pressure on her brain. The risks were high. "The part of the brain that was involved was concerned not only with speech, not only the speech centers but also those centers which are involved in controlling or giving power to the right arm and right leg," Khan said in an interview. "So contemplating surgery in this very sensitive area can have risks in terms of ... losing the speech or losing the power in the opposite part of the body, meaning the person can be paralyzed afterward." Khan pushed Malala's father for permission. "There are risks," Khan said, "but if you foresee that this patient warrants an operation and if you don't do an operation, she will lose her life, then you're going to take all the chances." The craniotomy began after midnight. Khan and his team removed a portion of her skull, removed blood clots on her brain and put Malala on a ventilator. To this day, Reynolds and Kayani say that without Khan fighting to perform that surgery, Malala would not be here. "That first surgery saved her life. Junaid operated when the world was looking at him," Reynolds told ABC/BBC News. "Surgery's about choosing the right time to do the right operation, and Junaid did that and he did the operation and I've got no doubt that he saved her life. He's a hero." As Kayani put it in an interview: "Malala is alive today, and two people can claim credit for that: One is the surgeon who operated on her in the early hours of Wednesday morning, and the other is the chief of army staff. If he had not been personally involved, Malala would not have survived beyond Swat." The surgery saved her life, but she was not out of the woods. And that is where Kayani and Reynolds' portion of the story begins. As the sun broke through on Wednesday morning, Kayani and Reynolds woke up in Islamabad on a prearranged visit to help the Pakistani military set up a liver transplant program. They met with the army chief just hours after Malala's initial surgery. As they spoke in his office, two very large TV screens showed news footage of the young Pakistani girl -- whom Reynolds had never heard of. The meeting ended without any mention of Malala, and Reynolds was about to go shopping. But that's when -- at Dr. Kayani's urging -- the military asked for their help, changing both of their lives forever. "Gen. Kayani had been given conflicting stories about her condition, and he wasn't sure about what to do next and whether he should move her and where he should move her to," Reynolds said in an interview. "They just wanted to know what I thought as a sort of expert from outside the country and someone who deals with children with head injuries all the time." Reynolds was told there was some risk in flying to Peshawar, but Reynolds didn't hesitate: "[Malala had] been shot because she wanted an education, and I was in Pakistan because I'm a woman with an education. So I couldn't say no." Twenty-four hours after Malala was shot, Kayani and Reynolds flew to Peshawar on a military helicopter to evaluate the situation and meet Khan. Both praised his decision to operate, but Reynolds was shocked at the hospital's facilities. The intensive care unit had one sink, which didn't work. The doctors were measuring Malala's blood pressure with a cuff every few hours rather than with an arterial line, which measures the pressure every few seconds. Reynolds worried that the lack of modern facilities were putting Malala's life -- and her ability to recover -- in jeopardy. "They had absolutely done the right surgery at the right time and had done it well," she said, "but there was also the possibility that the quality of the intensive care may actually cause her not to survive." The visit ran into the afternoon, and Reynolds was running out of time. She needed to decide on a course of action before the sun set. Pakistani military helicopters do not fly at night, and she was not allowed to spend the night in Peshawar. As she left, Reynolds urged Malala's doctors to change the ventilator settings to raise her carbon dioxide and increase blood flow to the brain. But more important was to get Malala out of there, fast. Kayani and Reynolds flew back to Rawalpindi and met with Pakistan's surgeon general. Reynolds urged him to bring Malala to the state-of-the-art hospital in Rawalpindi. Her life was "absolutely" in danger, Reynolds told the surgeon general, "and so was the quality of her recovery. ... The swelling that the bullet caused was very close and it would have been quite easy for her to have ended up looking like someone who'd had a stroke." But the doctors in Peshawar refused, believing her condition too fragile. So Reynolds and Kayani urged the surgeon general to dispatch his best doctors from Rawalpindi to Peshawar. Just before midnight, he agreed. The head of Rawalpindi's intensive care unit and another doctor drove the two hours to Peshawar to look after Malala for the night. It was yet another decision that saved her life. "The military asked, can we wait until morning?" Kayani remembers. "We said no." The doctors' fears proved true. Malala's condition had rapidly deteriorated. Reynolds recites the long list of ailments Malala was suffering from: She had a serious infection, her blood was not clotting properly, her blood acid had gone up, her blood pressure was unstable, her heart and circulation were failing, her kidneys had shut down and the doctors believed she had gone septic. The doctors sent from Rawalpindi had prevented her from dying. But that's all they could do in Peshawar, and Malala was in bad shape. "She'd now gone from being a patient with a head injury to a patient who had systemic problems, probably with infection, and her organs were shutting down," Reynolds said. Kayani and Reynolds canceled their return home to Birmingham. Instead, they once again flew to Peshawar, this time in a helicopter with a mobile intensive care unit on board. While Malala remained sedated, the team transported her back to Rawalpindi. Armed soldiers escorted its convoy to the hospital. By this time, Malala had undergone a blood transfusion, developed an infection and was "physiologically very unstable," Reynolds said. "For the first six hours I was terribly worried about her." Over the next 24 hours, the team changed the antibiotics, stabilized her blood pressure, averted any need for dialysis and got her off a large dose of adrenaline. "In my head she went back to being a patient with a head injury who had got over an infection, and at that point I thought she was probably going to survive," Reynolds said. On the day Malala was moved, her father, Ziauddin, asked Reynolds what would happen. "He asked me if there was any hope. And my response to that was, the only reason I'm here is because there is some hope. And he got quite emotional at that point," Reynolds told ABC's Diane Sawyer. "I told him, 'I think she's going to make it,' and he kissed my hand, which I think is quite unusual for a Pakistani man." The next day, on Friday afternoon, she remembers, "I was convinced she was going to survive, and I shared that with her father. And he cried." By Friday, Malala Yousafzai's name was on every major news program across the world. The Taliban claimed credit for attacking her and promised to finish the job. The military surrounded the hospital with soldiers. Snipers were posted on the roof. "The military realized they couldn't afford an attack," Kayani told ABC News. "So the hospital literally went into lockdown." Security fears helped push along a conversation that was sensitive in Pakistan: whether to send Malala abroad for treatment and recovery. The army and Malala's doctors knew that while she could receive good emergency care in Rawalpindi, she could not receive the rehabilitative treatment she would need anywhere in Pakistan. Offers poured in from the United States, the United Kingdom, the United Arab Emirates and other countries, offering admittance to specialized hospitals where Malala could not only be cared for but could also begin the slow process of retraining her damaged brain. But the army was worried about the politics, according to the doctors. Already, some Pakistanis called the story a "drama," code for fictionalized. Some claimed Malala and her father were CIA spies, and the near-death experience had been cooked up by the United States in order to get the Pakistani military to expand its offensives along the Afghan border. The army turned down the U.S. offers, according to Kayani, because "if she had gone to the states, conspiracy theorists would have been quote 'proven.' The army chief did not want that spin. If he could exclusively prove that the Taliban engineered the attack, he might get the specific wave of revulsion he was looking for to help prepare a public campaign against the Taliban." That campaign never took place. But the army and her doctors quickly came to a consensus: The best destination was Birmingham. The hospital where Kayani worked, the Queen Elizabeth Medical Center, was a worldwide leader in emergency and rehabilitative care -- the United Kingdom's equivalent of Water Reed National Medical Center -- where every British soldier injured in Iraq and Afghanistan receives care. And both Kayani and Reynolds lived in Birmingham and could help oversee Malala's recovery if she were brain damaged, or lost the ability to walk or use her right hand or leg. "Everything she would need," Reynolds told Malala's parents, "would be available in Birmingham." Kayani worked behind the scenes with the hospital and the U.K. High Commission in Islamabad. Diplomats cut through the red tape and secured both Pakistani and British government permission to send her to Birmingham. There was only one hitch: Malala's whole family would not be able travel with her. Ziauddin, her father, could come, but he did not want to leave his wife and sons. So Malala had to fly alone. Her father approached Reynolds and asked an extraordinary favor. Once she arrived in the United Kingdom, Malala would be under the care of the Pakistani high commissioner. But between Pakistan and the U.K., she needed someone else in charge. Ziauddin Yousafzai asked Reynolds to become Malala's guardian. "He just said, look after her," Reynolds remembers. To this day, she feels as though she is looking after Malala. The flight to Birmingham left Monday. When Ziauddin finally arrived in Birmingham, 11 days after Malala, he held a news conference in which he acknowledged how close he had come to losing his only daughter. He said he had drafted funeral plans. He called her survival a "miracle." "My daughter is my companion. I love her. There were tears in our eyes when we first saw her. But it was tears of happiness," he told a group of reporters, many of whom were crying with him as he shared his story. He called the man who shot her "an agent of Satan." But she survived, he concluded, because "I found angels on my side." Both Kayani and Reynolds have stayed in touch with Malala and her family over the past year and helped with her recovery. Reynolds told ABC News: "I think she will make an absolutely complete physical recovery." Kayani, like so many, is awed by what Malala is capable of. "She certainly has got more courage than a lot of men that I know," he told ABC News. "She certainly has got more courage than I have got. I don't think it's hubris to say that she is probably one of the bravest girls on the planet."